6-28 FREE Tropical Party ~ Massillon OH w/ PARROTS OF THE CARIBBEAN! You are here: Home / 6-28 FREE Tropical Party ~ Massillon OH w/ PARROTS OF THE CARIBBEAN! Not interested in Massillon ? Please choose a different community. More About 6-28 FREE Tropical Party ~ Massillon OH w/ PARROTS OF THE CARIBBEAN! FREE Tropical Party ~ Massillon Concert Series! There’ll be Dancin’ in the Streets when they block off Lincoln Way East for a Tropical Party & Concert! Come early… bring your chairs & coolers, then set-up around the stage for the Best seats @ this Musical Block Party! Take time to stroll & shop around Downtown; Grab a bite to eat at any of our fine Restaurants, like the Tiger Town Grille & Pub, Kozmo’s Grille, Jen’s Place Craft Beer Taproom, & many others; or purchase Snacks & Drinks from the Lions Theatre – Lincoln Ladies, & Homemade Ice Cream! Plus you can buy Adult Beverages at the Beer Garden - offering Beer & Margaritas! Then get ready, as the Parrots of the Caribbean ROCK You Buffett-Style, with great renditions on some of Jimmy & Friends Biggest Hits, Fan-favorite Originals, & more! Come dressed in your Favorite & Most Colorful Tropical wear, to become part of the sights & sounds of this Fun-Filled Summer Night! Join us in Thanking the Wonderful Sponsors providing Great FREE Summer Concerts! MCTV, Aqua Ohio, The Health Plan, Shearer’s Foods, Inc., Arts in Stark, & so many others! Send us your Best Selfies with the Parrots, & we’ll put them on our Facebook Page! The PARROTS OF THE CARIBBEAN, a.k.a. 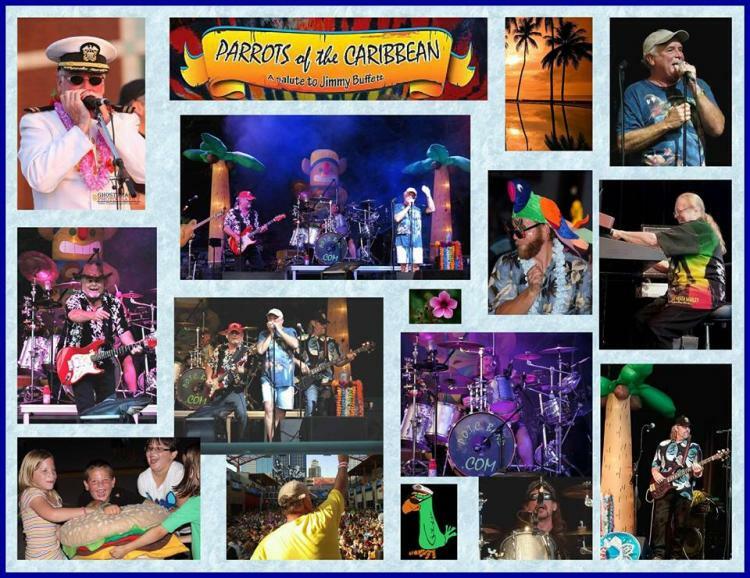 POTC Band, is the High Energy, Original Trop-Rock Stage Show that "Puts the ROCK in Tropical Rock" as we feature a "Salute to Jimmy Buffett." Quality musicianship from 5 seasoned professionals, performing our own original hits, a blend of Zydeco, Rock & Country, plus Buffett & Friends' biggest songs have earned us the acclaim, throughout the USA, Canada & abroad, as the "#1 Jimmy Buffett Tribute Act in the Country," delighting audiences for over a decade! We even had the honor of performing for our Troops in Okinawa Japan! While there, we were told by the officers, that not only did they "Love the Parrots of the Caribbean" but we were the "Best Tribute Act they had ever had”! What an Honor that was!! Lead singer and Kettering, OH native, Dave Albrecht, has developed an uncanny likeness to Buffett in both looks and sounds as he has emulated Jimmy for over 10 years. Dave also does a mean “Elwood” Blues impersonation. Twenty years ago he and a nine piece band were signed with "Legends in Concert," a top ranked show based at the Imperial Palace Casino in Las Vegas. In the year 2000, Dave switched gears and created the Jimmy Buffett persona, even fashioning Jimmy’s harmonica style by listening to Greg "Fingers" Taylor (from Buffett's Coral Reefer Band).